Boat Party Tickets: Going, Going… Gone! 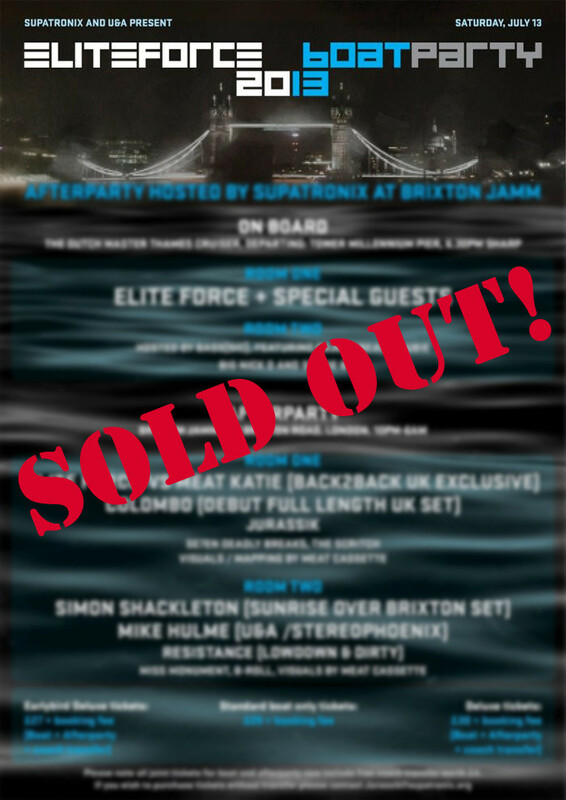 Tickets for next week’s Elite Force Boat Party have now sold out! For those of you who missed out, we’ll hopefully see you at the after party at Jamm. For those of you who do have your tickets, we’ll see you on board! A quick reminder:- the boat leaves Tower Millennium Pier on Saturday 13th July at 7pm sharp, so make sure you’re there nice and early to allow for a swift departure. The boat won’t wait for you if you’re late! That’s about all you need to know. If there are any changes to proceedings between now and cast off, we’ll let you know. We recommend you keep an eye on this website and our twitter account for any updates. Posted on 05/07/2013, in Events, News and tagged 2013, bass music, bass sic, boat party, breaks, dirty house, elite force, featurecast, london, sold out, thames. Bookmark the permalink. Leave a comment.